My recent trip to NY bagged me a new pair of Chelsea boots and a GI tract infection that blew me out (literally) for the better part of 9 days. I tried the usual over the counter medicine to no avail. A huge dose of kefir and GI flora in pill form seems to have righted the ship. I'm not sure why I picked kefir rather than yogurt. Perhaps because I had never had it. But it seems to have worked even if that is only anecdotal. Doing a little research on kefir however I found some interesting information. 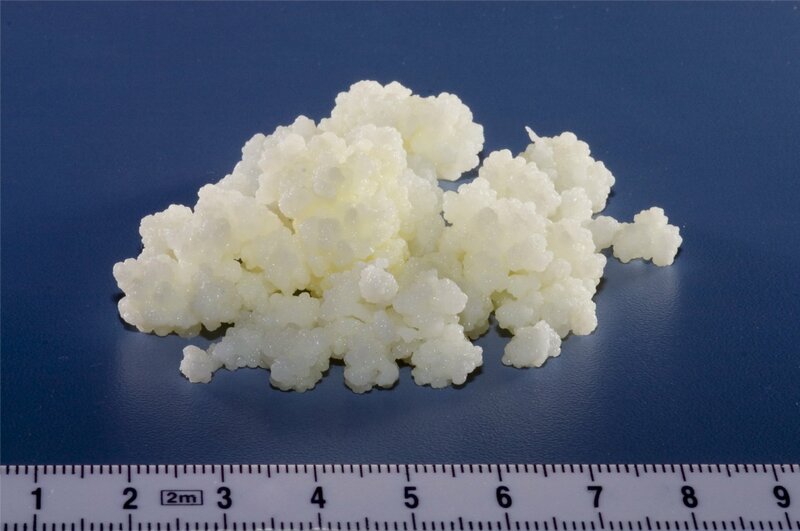 Kefir is made by fermenting milk with kefir grains. What confused me for a long time was trying to figure out what kefir grains were. Turns out they aren't grains as we know them at all. They are a symbotic combination of bacteria and yeast in a matrix of proteins, lipids, and sugars. It's this combination that processes the sugar in milk into kefir. Here's a photo of the 'grains'. This is similar to the 'mother' used to make vinegar which is just bacteria in a matrix. A slightly more off-putting photo of the vinegar mother. Interestingly we can't make kefir grains. They are a continuation of the first kefir grain that formed initially in Russia. You take some of the existing grains and make a new kefir batch and you've effectively grown more kefir grains but of the exact same lineage.